Susie and I were married on 1/1/11. She wanted to get married on 13/13/13 but I told her I didn't want to wait that long. This is when it all started. The following is how. Susie comes from a cowboy family, out where the first rodeo was born. I have been involved in agriculture and cattle most of my life. Prior to us walking down the aisle we would discuss what we wanted to do with the acreage that we had. We tossed around several different breeds and even thought about raising miniature bucking stock for youth rodeos. We began researching and Susie mentioned Longhorns. I was completely against it in the beginning due to my limited exposure to them and my thinking that they were just a novelty. As our research continued, the more impressed we became. found we can get a little'un that looks exactly like their mom or dad. You never know what the heck you're gonna get in coloring. We always say that the color is totally up to God. It's downright fascinating. Then there's the horns. While we do have some control with genetics, it is simply a blast to watch them grow and see which direction they go. Genetics does also play a key role in developing these cattle into more than just a novelty. We aspire to breed the best genetics to produce cattle that will provide more and better quality beef than the historic longhorn. Now, what about their historic background? Over the centuries they have learned to survive. Longhorns are as hardy an animal as you will ever find, except maybe a cockroach or fly. They are incredible mommas and could calve every 11 months if desired, and can produce healthy offspring well into the age of 20 and older. All of our Longhorns are registered, named, and have unique personalities. We consider it an honor to be a part of helping to restore and improve this awesome breed. While our goal is to raise breedstock for advancement of the breed, not all can make the cut. We strive to pass on only the best genetics, not only for the breed stock, but for the production of delicious, healthy, beef. Due to all of the trials and tribulations their ancestors have had to overcome, Texas Longhorns provide us with one of the leanest meats you can find. This really got us excited in our research phase. 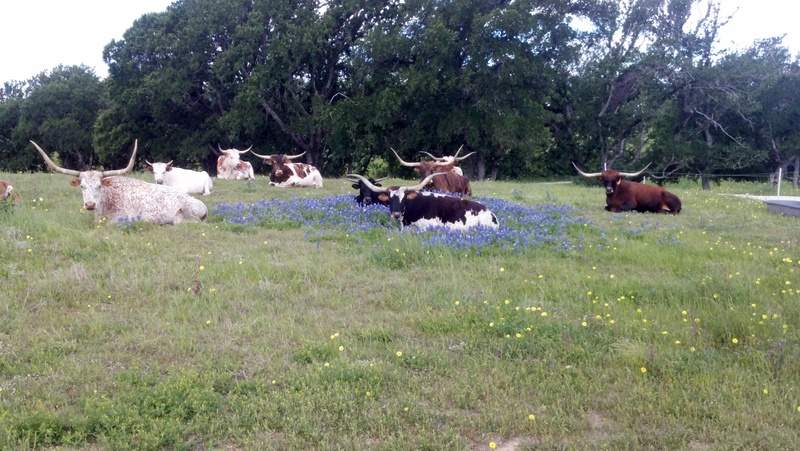 When you add the health benefits of being completely grass fed and pasture raised, the choice of Texas Longhorns was an easy decision. And now, here we are 8+ years down the road and have enjoyed (almost) every minute of it. We hope you enjoy following our journey, seeing our pride and joy in raising these amazing animals, and will give us a call or shoot us an email if you are interested in purchasing any of our Longhorn cattle for your own breeding program, or in our amazing beef products.